I spent the entire day on this picture and I wanted to move towards adding some shadows / additional textures and trinkets, but I Think I somewhat failed with the basics. 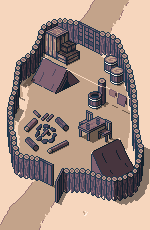 I don't know how to grasp the isometric perspective, and I was wondering if anyone could take a look and explain what I'm doing wrong an how to fix it. I don't know how to answer this suggestion. However, in the isometric attempt it constantly escapes me. I just can't figure out how can I repeat this approach. Any suggestions? 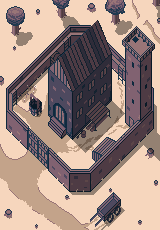 The roof on that castle is incorrect. At your angle in isometric perspective it would be impossible to see the other side's slope. I tried to re-draw this roof many times, just because I can feel there is something wrong about it, but I can't put my finger on the right solution. 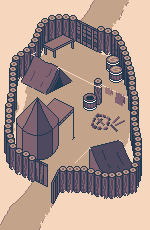 Here is the newest version of the military camp! It is unusual for video games, due to numerous reasons. I know only a two games using it: Warcraft 2 and Ultima Online. Oh, I see! Thank you for letting me know and for showing me the example!